On November 11, the Portolá Expedition of 1769 traveled two leagues, about 5.26 miles, to a point in the lower Cañada de Reymundo, and made their first camp on their return trip. 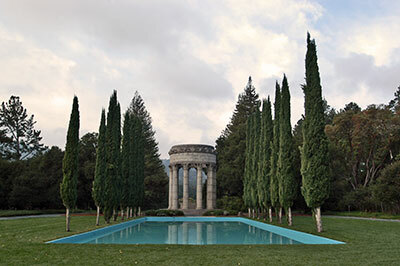 We have been unable to locate a commemorative plaque for the Portolá Expedition Camp at the Pulgas Water Temple. Portolá called a council of officers, on November 11th, to determine the best course to pursue. The decision was unanimous to return to the Point of Pines and renew the search for the elusive Puerto de Monterey, which they believed they had left behind. This was at once acted upon, and the command took up the march in the afternoon of that day, returning by the route of its coming, and on the 27th camped in sight of the Point of Pines at a little lake of muddy water.